LonWorks® Technology is the latest in microprocessor capability that gives the user the highest level of application flexibility. A large graphic screen, multiple inputs and very easy setup with easy field upgrade characterize this new technology. Removable power cord and plug outlets make installation easy. For use with process-type ORP sensors; ordered separately. 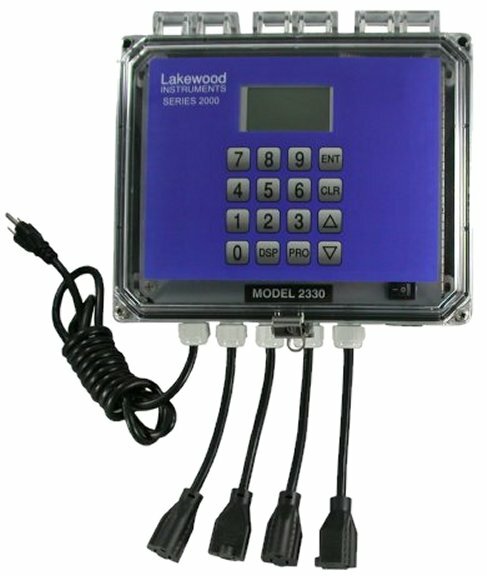 Two water meter inputs, ORP sensor input, flow switch input, four relay outputs, and Power On/Off switch in a NEMA 4X enclosure are all standard features. Includes four relays for chemical feed, and alarms; expandable up to 12 relay outputs. Expandable in the field with the use of the Nodes for additional inputs, such as additional sensor inputs or additional outputs such as relays, 4-20 mA, LonWorks, and remote communications. Able to feed chemicals by multiple feed schemes including by feed schedule, setpoint control, percent of blowdown, percent of time, and by water meter. Includes sensor diagnostics and alarms. 2330Pe .. LONWORKS Technology-based ORP controller. Four relays are integral to the system. The relays may be configured for ORP HIGH/LOW setpoints and alarms. ORP range is -1000 to +1000 mV. Controller includes power cord and outlet receptacles. Requires sensor (530-4 Series). -35L Two 4-20 mA output configurable for remote data acquisition of ORP. NEMA 4X Comes with ½ inch conduit knockouts. Refer to the 2000 series introduction section for more information. SEE THE 530 SERIES FOR PROCESS ORP SENSORS.